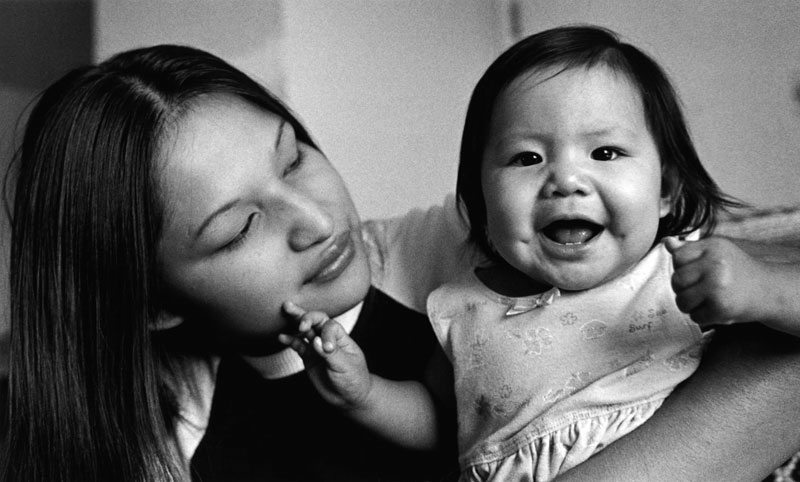 From “Arapaho Journeys,” Tessa Bell and her daughter Patricia. Sara Wiles photo, 2000. Arapaho Journeys featured contemporary photographs by Sara Wiles of Northern Arapaho people—elders, children, families, and leaders. The exhibition’s insightful photographs of the people, as well as the tribal activities, of the Northern Arapaho invited viewers into the culture, values, and philosophies that guide contemporary Arapaho life. They also honor individuals who have contributed much to their own communities as leaders, artists, and traditionalists. While providing a historical background for the Northern Arapaho, the exhibition also depicted the experiences of younger tribal members growing up on the reservation as they participate in traditional cultural activities. As one of two American Indian tribes with contemporary homelands in Wyoming, the Northern Arapaho constitute an important element of the state’s heritage. Arapaho Journeys was supported in part by a grant from the Wyoming Cultural Trust Fund, a program of the Department of State Parks and Cultural Resources.